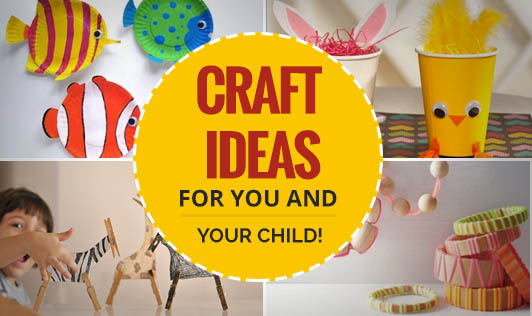 Craft Ideas For You And Your Child! Crafts are essential for children's development. It gives them an opportunity to express themselves creatively, learn better math by identifying shape, size etc and learn more about colours. It also improves their hand-eye co ordination and motor control. Apart from this, it makes them think faster and make decisions quicker, making them smarter. • Cut out 5 cartoon characters and give it to your child to colour. • Cut out a ½-inch wide strip of paper that is long enough to go around the top portion of your child's finger. • Glue the ends on the strip to form a band. • Glue this band to the back of the coloured cartoon characters to make finger puppets. • Pour few drops of both oil paints in circular motion in the bucket of water. • Dip the vase in the centre of the bucket. The paint will stick to the vase. • Allow it to dry. • Draw a design on the cardboard sheet (flower, strawberry etc). • Based on the design, choose colours to mix with semolina. • Divide semolina into the number of colours being used. • Mix water colours with semolina and allow it to dry. • Apply good amount of glue on the drawing and spread coloured semolina on top of it. • Punch holes on top the sheet, attach strings to it and hang it on the wall. • Wash and dry egg shells. Colour each shell with a different colour, let it dry and crush the shells. • Draw any design on the cardboard sheet. • Apply glue on the design. Spread and stick the coloured egg shells. • Cut a circle in the white cardboard and paint it yellow. Sprinkle glitter on it and allow it to dry. • Paint your child's hand yellow and print it on the orange cardboard. Make 5-6 hand prints. • Cut out the hand prints and stick it behind the yellow circle to make a sun. • You can draw eyes, nose and mouth on the sun.